The just-released Honda CR-V DTi-L Limited Edition sees a welcome return of a turbo diesel option to the Series II line-up launched late last year. It’s so fresh off the boat that the 1.6-litre mid-sized family hauler missed the start line for our all-paw, all-diesel SUV shootout back in August. Given that new kid Hyundai Tucson Highlander 2.0 CRDi AWD took top honours against the segment’s prime shakers – in goodness, in sales dominance – why not pit the fresh Japanese range-topper against the Korean reigning champion? So what newness does the Honda bring to the party? Well, its 1.6-litre oiler bucks the segment convention of larger 2.0- and 2.2-litre oilers, indeed effectively replacing the now defunct two-point-two put to pasture with CR-V Series I’s demise. Added to the across the range changes introduced in Series II (read more about the changes here), the new DTi-L also adopts a number of distinctive exterior changes – new grille and headlights/daytime running lights/taillights; new front and rear bumpers; chrome door handles; and new 18-inch wheels – together with a healthy list of features befitting the thick end of the medium-SUV price range. The CR-V DTi-L LE lands at $44,290 before on-roads. On one hand, it’s up on the 2.2 DTi-L ($43,040) it replaces. On the other, it’s a noteworthy, if marginal, $1200 discount compared with the Tucson Highlander 2.0 CRDi AWD’s list price, though both protagonists pitch on value given that some medium segment competitors, such as Toyota’s RAV4 Cruiser AWD diesel, nudge the $50k mark. The Honda is quite well equipped, though many of its standard-fit gear, such as HID headlight technology, front and rear parking sensors with a reverse-view camera, cruise control, auto wipers, electric folding mirrors, fog lights and 18-inch alloys wheels can be had on more affordable CR-V variants in the range. There are active LED cornering lights and an all-new electric tailgate that can be operated four ways (more of this shortly), though our test car lacks the sunroof that can be had in the slightly more affordable ($42,290) VTi-L petrol variant. In essence, the premium you pay is for that powertrain: diesel engine, part-time all-wheel drive and, of particular note, a nine-speed automatic transmission. The Hyundai, though, counters the Honda everywhere, with full LED lighting front and rear including ‘static bend’ headlights, the similar parking sensor and rear-view camera functionality, added heating to its power folding mirrors and inch-larger 19-inch wheels with wider (225mm versus 245mm) rubber. An electric tailgate is a tick, though the Highlander spec does loan in a full-length panoramic electric sunroof as standard issue. Where the two diverge noticeably is in advanced safety and driver conveniences. The CR-V gets the usual tick list of braking assist and stability control essentials, but supplementary systems are fairly rudimentary: hill descent control, trailer stability assist and tyre deflation warning add to niceties such as automatic high-beam and hill-start assistance. Despite the five-star ANCAP rating and six-airbag surety, leading-edge active safety is a little thin on the ground – the rather excellent ADAS (Advanced Driver Assist System) suite of safety systems, a $3500 premium on petrol CR-V VTi-L AWD, isn’t even on the diesel version’s options list. Nor, strangely, is Honda’s nifty LaneWatch left-lane camera monitoring – as fitted on high-spec petrol CR-Vs – part of this particular limited-edition version. The Tucson takes the higher ground here by some mark, and not merely for offering the same airbag count and five-star ANCAP credentials. Standard-fit active safety includes Emergency Braking with Pedestrian Recognition, blind-spot monitoring, lane keeping assist, lane departure warning, rear cross-traffic alert, Trailer Stability Assist and understeer-mitigating Advanced Traction Cornering Control. Before climbing into cabins to judge more conspicuous bells and whistles, the Tucson takes a win on core value for punching above price point on safety features under the skin. To our reasoning, the suite of safety technology the Hyundai boasts has more substantial worth than the mere $1200 separating these two SUVs. Though the CR-V appears the higher rider in SUV convention, both present a comfortably moderate seat height in both rows when climbing in. On the door, the Honda’s front doors are slightly heftier, requiring a little more arm muscle. Both get leather trim, but the Tucson has superior front pews: higher class in design, more shapely, the leather feels marginally suppler and both driver and passenger sides are electrically adjustable (the Honda is manual only on the left side). Whereas the CR-V gets heating function, the Tucson offers both heating and cooling up front. Interestingly, the Honda has quite a high floor and shorter passenger footwell, though it’s slightly less roomy rather than being properly cramped. In fact, the CR-V is downright spacious and airy, with a comfortable driving position that’s not overly ‘propped up’, yet provides superb all-round visibility through the generous glasshouse. It’s really easy the judge the Honda’s extremities from behind the wheel. The Tucson’s seating is a little lower-slung, visibility to the outside world not quite as fishbowl like, though there’s certainly no restriction in vision unless you’re a child in the second row. As we’ve pointed out in test pasts, the Tucson’s swooping, attractive side window rake may become the bane of lollygagging youngsters’ misery. General roominess? Both are generous, particularly in the rear, and as mid-sized SUVs both feel properly large and capable of hauling five adults in appreciable comfort. Head-, shoulder-, knee-room – one may be incrementally better than the other, though neither is superior in any meaningful measure. The Honda’s flat rear floor, to facilitate the Magic Seat functionality as much as room for big feet, is quite neat. However, the Tucson is a whole rung above in presentation. It’s a more premium league. Much of this is due to Honda’s staid and somewhat dated styling – generally, in the details – and the use of hard shiny plastic in quite conspicuous places, such as large areas of door trim and the dash fascia. For a forty-something-grand offering it appears downright twenty-something in places. And Honda’s unimaginative colour choice, compared with Tucson’s richer combination options, certainly suits buyers with conventional, conservative tastes. The blue ambient lighting, though, is a nice splash of class. The Honda is certainly functional. The small city car-like steering wheel, though plasticky to touch, offers simple and clear controls, oddment storage is useful and logically located, and there’s a stack of connectivity ports (two 12V sockets; two USBs; a single HDMI video port). The Tucson makes do with less (two 12V; single USB; single AUX). Both thankfully offer dedicated climate control systems that don’t require digging into touchscreens, plus rear air-con vents, centre arm rests with integrated cupholders and full compliments of conventional child seat strap tether and Isofix points. Neither offers an infotainment system that will keep German makers’ awake at night, the Honda’s Display Audio system functioning via a modest seven-inch touchscreen, the Hyundai by way of a larger eight-inch unit, neither offering separated, dedicated controllers. The Tucson does have a finer, more techy driver’s display screen with – halleluiah – a digital speedo that the Honda, in fine Japanese tradition, omits. Interestingly, the Honda adopts a conventional handbrake instead of the electric design favoured by Hyundai. The CR-V offers a huge 556 litres with the rear seats up and transforms to a whopping 1648 litres via Honda’s excellent, easy-to-use Magic Seat trickery. Pull the lever in the cargo sidewall and the rear seat’s backs and bases fold, in a choice of split-fold combinations, to form a flat load area in elegant movements. The Tucson has just 488 litres with the second row in play, its cargo load height set higher than that of the Honda. The conversion to a maximum 1478-litre luggage space is less articulated – just the seats backs drop – though, equally, it’s an easy one-handed flick of a lever at the seat of the seat bases. The ‘high or low floor’ argument offers pros on both side: the low floor offering more flexibility with loadspace, the higher floor less back-breaking when placing heavy objects or – as many parents will want to do – when used as the default nappy-changing area for babies. The fitter option, then, depends on the buyer’s tastes and needs. Both allow their cargo blind mechanisms to relocate to rear of floor as parcel stops. Both, it’s worth noting, are equipped with full-sized spare wheels under the their respective floors. And neither SUV wins the (slow) race in automatic tailgate actuation, be it opening or closing. For family swallowing practicality, then, the Honda grabs line honours. It’d be easy to presume Honda’s move from 2.2- to 1.6-litre diesel power puts the CR-V on the back hoof in a segment where two litres – such as the Tucson’s engine – or more are the go-to engine capacities. But at 118kW (at 4000rpm) and 350Nm at a rather high 2000rpm not only supplants the old CR-V oiler for all-round energy, it’s downright competitive on output in the company of the medium-SUV status quo. However, the Tucson’s 136kW (at 4000rpm) and 400Nm combination is a segment-leading act. Better still, its higher peak torque arrives at just 1750rpm. Any glory in these numbers, though, pales in the significance of gutsy drivability and real-world fuel economy. For the latter, Honda claims 5.9L/100km combined, the Hyundai a 6.8 in want-for-little Highlander trim. 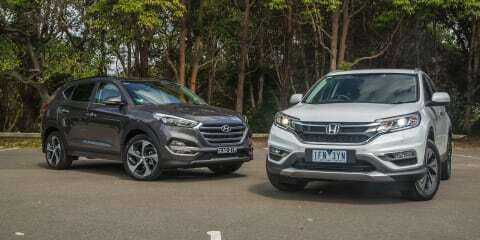 And while neither got close to their claims on a mostly urban-ised testing program – sevens for the CR-V, eights and nines for the Tucson – the Honda proved the friendlier of the two on the hip pocket. And yet the CR-V wasn’t left wanting in urgency, either. The nine-speed automatic, a reasonably silken and intuitive self-shifter, does a fine job of keeping the 1.6 on the boil in its narrow-rpm sweet spot. The Honda has more pulling power than most owners might reasonably need. Ignoring the superfluous wheel-mounted paddleshifters, the CR-V automatic’s Sport mode is very handy indeed, raising the ratio shift points and presenting a useful and tangible urgency to the powertrain that’s great for punching holes in urban traffic. The Tucson is gutsier still, though only marginally. It makes do with six forward ratios from its conventional automatic, but suffers nothing for its in around town drivability. And like the Honda, its Sport drive enables a noticeable change in character that ups the potency of the driving experience without robbing it urban friendliness. That the Hyundai is little smoother everywhere than the more frugal Honda makes it something of a dead heat on the powertrain stakes. Neither is bereft of the dreaded four-cylinder diesel rattle at idle or low rpm, though neither presents noise intrusive enough to be overly annoying to live with. On the positive side, you do notice the engines because each is, on balance, a quiet operator on the move. Tyre noise is noticeable on coarse road surfaces – surprisingly, it’s the Honda, with its narrower 225mm Michelin Latitude Sport rubber, that generates more rumble than larger 245mm footprint plied by the Tucson’s Continental ContiSportContact. Equally surprising is that the ride quality of the Honda is more terse and animated at low speed and over high-frequency road imperfections given its tyres’ large 60 series sidewalls. The Hyundai, then, is more supple and sanguine despite wearing a lower-profile 45 series – it’s as if the Koreans spent more time and effort ironing out ride quality than the Japanese did. And so it proves the instant to hit speed humps. The Hyundai’s suspension is more cushioning when impacting the bump, the vehicle settling quickly and confidently thereafter. The Honda is good at handling both compressions and rebound, though not quite as polished as its present nemesis. Both offer impressive levels of on-road grip, the Tucson perhaps a little more assertive in road-holding, if only at a pace most owners might never dare to venture. More noteworthy is the commendably high quality of the rubber chosen, as both tyre models are, grip wise, exceptionally good in dry or wet conditions. There’s torque enough in either SUV to present wheelspin issues in dry sealed-road running, let alone on wet or broken surfaces, though both part-time all-wheel-drive systems on test are so seamless in apportioning drive that it’s indiscernible when, or indeed if, torque to plied to the rear ‘on demand’ axle. Regardless how forcefully you smack the throttle pedal diving in to and out of side roads, either SUV just grips and goes. Around town, the Hyundai has the more lightweight steering, the Honda presenting a little more heft that’s more noticeable during parking and low-speed manoeuvring than it’s on the move. The CR-V’s brake pedal, too, is a little touchier in feel than the Tucson. As with many aspects between these two, differences are in shade and degrees than they are glaring differences. For its slighter more resolved on-road character, the Tucson edges the CR-V out. Just. The Tucson takes the honours here. For a start, Hyundai offers an impressive five-year and unlimited-kilometre warranty with one-year of roadside assist, whereas Honda covers the CR-V with the more typical three-year/100,000-kilometre coverage. Also, the Tucson’s service intervals of 12 months or 15,000kms (whichever comes first) are much more enticing than Honda’s six-month/10,000km regime. Though price-capped servicing information for the 1.6L was unavailable at the time of writing, the average cost of $748 per annum for the old 2.2L version can’t compete with Tucson’s $403 annual average cost across a five-year timeframe. Hyundai’s factory capped-priced scheduling, though, extends through to a whopping 168months/210,000kms. On balance, the flagship Tucson Highlander is the more comfortable, refined and upmarket mid-sized SUV. Its blend of modernistic styling inside and out, near-premium quality in cabin, foible-free on-road experience and sheer x-factor will no doubt win many medium-SUV shoppers over. However, this new 1.6-litre DTi-L Limited Edition is an impressive diesel all-wheel-drive update and an enticing addition to the CR-V Series II range that creams its forebear everywhere that counts. And if maximum utility is a priority, the Honda is the more pragmatic choice. Both do everything and anything you need from a medium-sized family hauler with nothing like a deal-breaker in sight form either camp. You won’t lose opting for either. However, it’s the Tucson’s clear dominance in active safety features, while matching or surpassing the top dog diesel CR-V across the balance of standard-fitment equipment, that hands the win to the Korean car. Click on the Photos tab for more images by Brett Sullivan.